Somewhat above the 41.2% average for Western Europe, 45.8% of the total value of the business-to-business (B2B) sales of respondents in Italy were made on credit. This does not differ significantly from what was recorded last year, and places Italy in the cluster of Western European countries (along with Ireland, Spain, and Great Britain) recording an average value of B2B credit-based sales which is more or less consistent with the average value for Western Europe. The above mentioned cluster falls in between two other groups of countries, with a completely opposite approach to granting trade credit in B2B transactions. Austria, Switzerland, Belgium and France show, on average, a more risk-averse approach to granting trade credit. Greece, Sweden and Denmark appear to be the most inclined countries in Western Europe to offer credit terms in B2B transactions. On average, Italian respondents come across as being much more inclined to grant trade credit to domestic than to foreign B2B customers. 52.8% and 38.7% of the total value of domestic and foreign B2B sales respectively were on credit (survey averages: 44.8% domestic and 37.7% foreign). This suggests respondents in Italy perceive the risk of payment default more likely to arise from credit-based sales to foreign than to domestic customers. This perception appears to be uniform in the Southern European countries. 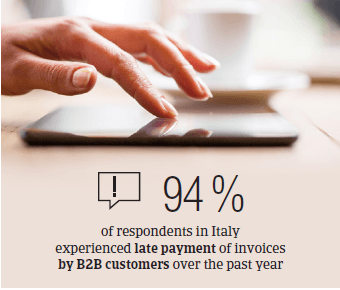 94.0% of respondents in Italy (88.0% in Western Europe) experienced late payment of invoices by B2B customers over the past year. 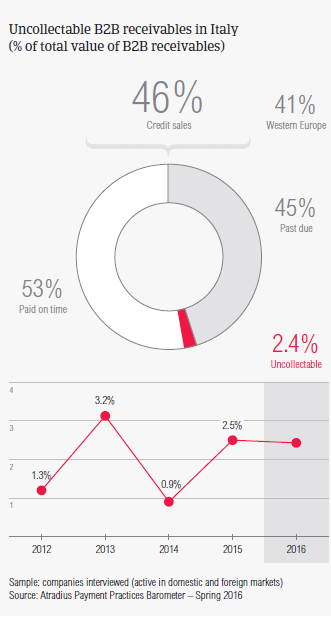 This resulted in an average of nearly 45.0% of the total value of B2B receivables remaining outstanding past the due date. This is above the 40.0% average for Western Europe, and is stable compared to last year. Late payment of invoices was reported by Italian respondents to occur, for the most part, on the domestic market. This makes Italy the country most impacted by late payment of domestic invoices in Western Europe. A somewhat similar domestic payment default rate was observed only in Greece. This points to a very poor quality of domestic B2B trade debtors in both countries. Late payment of invoices (domestic and foreign) is reflected in the Days Sales Outstanding (DSO) figure posted by respondents in Italy. This averages 82 days (high above the 48 days survey average) and is ten days longer than last year. This may reflect a relatively poor performance in collecting high value long outstanding invoices, particularly foreign invoices, than in most other Western European countries. More respondents in Italy (27.4%) than in Western Europe (22.4%) expect their DSO to worsen over the next 12 months. This suggests expectations that financial and administrative costs of carrying trade debt will increase. This may explain why most Italian respondents (24.4%) are almost as equally concerned as those in Western Europe overall (23.4%) about cost containment this year. This to protect business profitability. Average payment terms extended by Italian respondents in B2B trade on credit average nearly 48 days from the invoice date (above the 31 days survey average). Domestic customers are given an average of nine days longer than foreign customers to pay invoices. 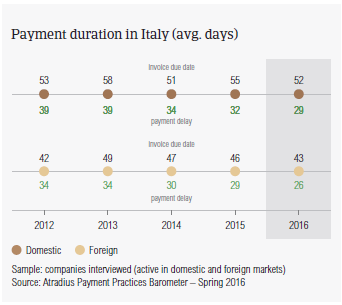 Compared to one year ago, payment terms granted by Italian respondents to B2B customers appear to be slightly shorter (by an average of 3 days). 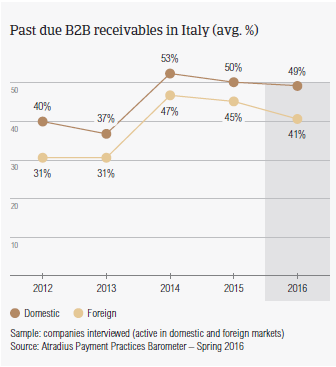 Despite this, domestic and foreign B2B customers of Italian respondents settle past due B2B invoices, on average, within one month of the invoice due date. This is around one week longer than the survey average, and one week longer than last year. Consequently, respondents in Italy could turn overdue invoices into cash only after an average of 80 days after invoicing (survey average: 53 days). This very long average collection period negatively impacts businesses’ cash flow positions, as they have to bear costs to cover for this temporary liquidity shortfall. No surprise than that most Italian respondents are worried about the impact of costs on business profitability this year. As the insolvency environment in Italy remains quite challenging, it does not surprise that far more respondents in Italy (79.8%, up from 73.0% last year) than in Western Europe (57.9%) experience late payment of domestic invoices most often because of liquidity constraints of customers. 22.0% of Italian respondents, experienced late payment of domestic invoices due the customer intentionally using outstanding invoices for their own financial advantage (respondents in Western Europe: 28.2%). This has not changed since last year. Also late payment from foreign customers was reported to occur most often due to the customers’ lack of liquidity. More respondents in Italy (48.3%) than in Western Europe (40.2%) cited this. Foreign payment delay is also most often attributed to the complexity of the payment procedure as well as to inefficiencies of the banking system (around 23.0% of Italian respondents, in line with the response rate in Western Europe). As a consequence of late payment of commercial invoices, notably more respondents in Italy (41.0%) than in Western Europe (23.7%) had to delay payments to their own suppliers. Twice as many respondents in Italy (24.3%) as in Western Europe (12.8%) requested an overdraft extension. To protect the business from the negative impact of late payments, notably more respondents in Italy (around 41.0%) than in Western Europe (33.7%) plan on checking their customers’ creditworthiness and monitoring their customers’ credit risk more often this year. The proportion of B2B receivables reported by Italian respondents as uncollectable (2.4%) is well above the 1.3% average for Western Europe. Domestic uncollectable receivables were written off more often than foreign ones. This may be due to the greater proportion of domestic than foreign sales made on credit. Uncollectable B2B receivables originated most often from the construction, consumer durables and services industries. For more respondents in Italy (35.7%) than in Western Europe (28.5%), B2B receivables were uncollectable mainly due to failure of the collection attempts. Write-offs were mainly due to the high costs of pursuing the trade debtors, particularly in export markets, as well as the customer being bankrupt or out of business (around 45.0% of respondents in Italy and Western Europe alike). 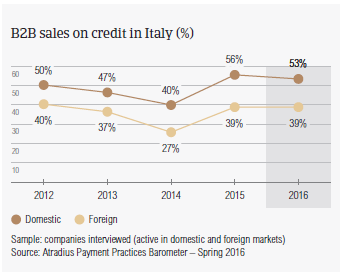 Italian respondents reported granting trade credit terms mainly to B2B customers belonging to the consumer durables, construction, and services industries. Invoice payment terms extended to B2B customers in the financial services industry are significantly longer than the country average (averaging 63 days from invoicing). B2B customers in the construction industry are the slowest payers. On average, it takes them twice as long as customers in the other industries to settle past due bills. The construction industry generated an above average (for the country) proportion of overdue invoices. According to most of the respondents (around 60%) this is likely to be chiefly due to liquidity constraints of customers in this industry. For nearly 33.0% of respondents in this industry, customers use outstanding invoices for their financial advantage. Around 40.0% of Italian respondents expect payment practices of B2B customers in all the industries with which they mainly trade on credit to deteriorate significantly over the next 12 months. This will be particularly the case for the services industry. No significant change is anticipated in respect to payment practices of other industries.